In 1980, the descendants of Allen and Eliza Good deeded the family farm which was then on the outer edge of the development taking place in Brantford to Heritage Canada. 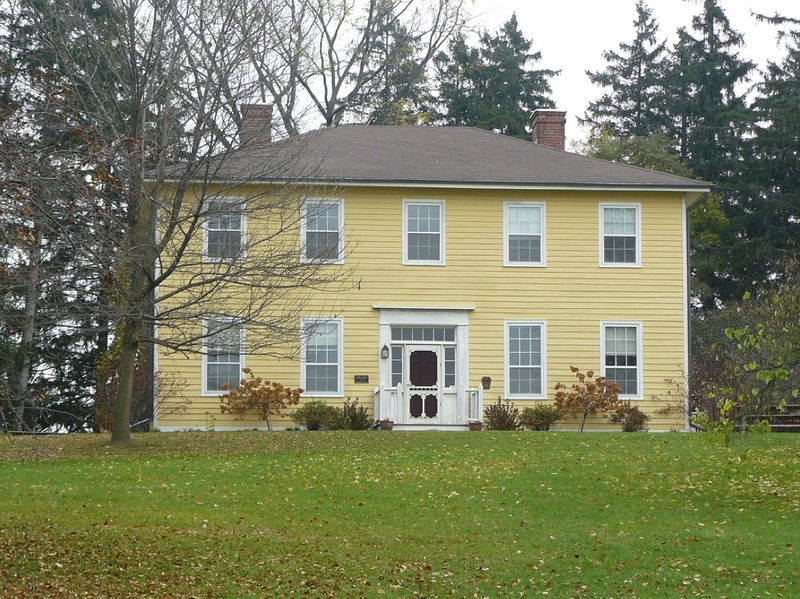 When it officially opened in August, an editorial in the Brantford Expositor stated that, “not many centres in Canada can boast a museum house as unique as Myrtleville… Built in 1837, it is described as being in mint condition as well as containing a collection of furniture and artifact hard to match anywhere.” Thanks to Heritage Canada, 175 years later that statement is as true today as it was then. But times have changed! Today urbanization has surrounded the Myrtleville site. Heritage Canada, a national charity and not a government agency, has shifted its strategy in how it assists and promotes heritage in Canada. Over the past two years, it has moved away from the property management approach modeled after the British National Trust and has been focusing on developing partnerships to preserve historic sites. At the same time, governments of all levels have been under pressure to reduce expenditures. Not-for-profit organizations such as the Brant Historical Society fight for every dollar they raise in an increasingly competitive market. Donors today are placed under enormous pressure to contribute to many worthy causes and as the economy continues to stagger, this will increase. So where does this leave Myrtleville? There is no doubt that Myrtleville House and its contents are an important historic asset to this community. Most of the furnishings and artifacts were donated by the Good family and in many respects it is their history as well. A series of articles written by Gary Muir for the Brantford Expositor describes the family’s trek from Ireland, the involvement in the Rebellion of 1837, the Gore District Mutual Fire Insurance Company, the Canadian Council of Agriculture, and the formation United Farmers of Ontario. They were involved in politics at all levels and played an important role in the social infrastructure of the community. It is therefore understandable that the Good family remains interested in the future of Myrtleville. Myrtleville has also played an important role in offering community programs and educational activities under the stewardship of the Friends of Myrtleville and, more recently, the Brant Historical Society. Last year more than 2,000 primary students participated in curriculum based programs carried out by Myrtleville including school visits by a nineteenth century teacher. Numerous PA Day programs and summer camps provide further interaction with students. Quilting events, Easter egg hunts, family days, art shows, and special presentations focusing on needlework, Victorian hair wreaths, and more recently a celebration of Myrtleville and Brantford in history have been aimed at a wider audience. Myrtleville has also served as a backdrop for CBC’s popular television series Murdoch Mysteries, weddings and even anniversary photos. Volunteer help with special events and gardening and up to six students are employed in summer programs under the direction of Lisa Anderson, Myrtleville’s Education Officer. So what are the challenges? The first is financial. Any organization, including the Brant Historical Society, that is considering coming to an arrangement with Heritage Canada on the Myrtleville property, would want to understand the financial implications both from an operational and capital perspective. The question is: is there a revenue model that would allow operation of the facility at a minimum of a cash neutral position? As well, we need to ask what capital resources will be required to maintain the property in the future. It would be a mistake in my view to take on the responsibility for Myrtleville at the expense of other services offered by the organization or recognizing that it is only a stopgap measure leading to a crisis down the road. The second is programming. While Myrtleville offers a good range of programs, the issue is how to continue to make these relevant to our changing society. The study of history, for example, plays a much less role in educational curriculum than it did twenty years ago. Modern museums have moved away from simply presenting artifacts and relying on patron visits. They have developed interactive and virtual programs designed to maximize the use of technology and outreach. So the question then becomes can we find a way to accomplish this, maintain community relevance, and build a new audience? And, at what cost? The third is community commitment. Those who actively support the preservation of heritage buildings no doubt recognize the importance of Myrtleville. Generally, however, public attitude is one of indifference. I would suspect that although Brantford Council would be prepared to morally support any effort to preserve the site, the allocation of resources to support the site would be a matter of hard debate as they struggle not to increase the city’s operational costs. So the onus is on whoever enters into an arrangement with Heritage Canada to move the hearts and minds of the community to not only support their efforts to maintain operation of Myrtleville, but also to commit to using the resource and assist in ensuring that there is financial stability. Finally, can Myrtleville become a national destination site? This to me is a fundamental question. What we do locally is important and brings meaning to the interaction between Myrtleville and the community. I suspect, however, that the financial viability and return on investment that is made locally will barely meet the financial needs to operate such a facility. So the question becomes is whether there is a way in which Myrtleville can attract a broader audience from outside the community. This not only generates money to support Myrtleville – it benefits local businesses. This will require a rethinking of programming, advertising, signage, and facility utilization. I personally hope that we can find a way to ensure that Myrtleville continues and that some accommodation can be reached with Heritage Canada. At the same time, we need to be practical. There is no point in solving one problem while creating another. We need to ask the questions. We need to know that there is a chance of success in ensuring long term stability. Most important, we need the commitment of the city, the Good family, Heritage Canada and the community to make it work!